Front row (left to right): 1. Gerald Vargas, 2. Bill Fisk, 3. Alan Shelly, 4. Jim Nickerson, 5. Hollis Grieve, 6. Richard Norwood, 7. Ron Accioli, 8. Don Sands, 9. Charles Sage. Second row: 1. Marion Richardson, 2. Betty Smith, 3. Esther Cleek, 4. Loretta Silva, 5. Darla Beavers, 6. Sharon Higgins, 7. Delia Jeffery, 8. unidentified, 9. Leeann Whitbeck, 10. Leona Rasmussen, 11. Delphine Bankhead. Third row: 1. Mrs. Brown, 2. Wayne Armstrong, 3. Geraldine Jones, 4. Betty Davis, 5. Margaret Vargas, 6. Bonnie Hampton, 7. Cherrill Dickey, 8. Susan Baylos, 9. Scott Schenone. Fourth row: 1. John O'Malia, 2. Roger Jensen, 3. Bernard Valdez, 4. Pat McLaughlin, 5. Lyle Millsap, 6. John Etheridge, 7. Jim Street, 8. Nick Bubnar, 9. Stan Roudebush. Credits: From the collection of Jim Street. Scanned by Jim Street. 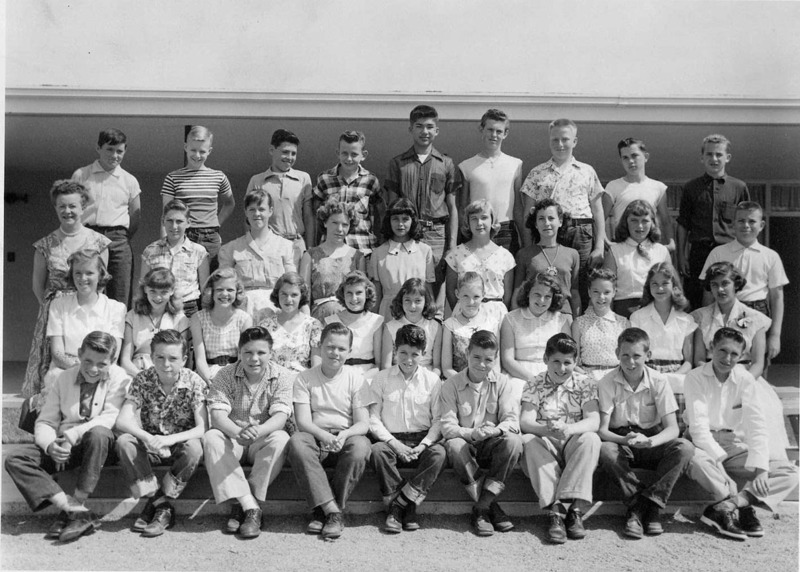 Thanks to Jim Street and Delia (Jeffery) Ingersoll for identifying the kids in this picture.